The hotel has been opened in the year 2000 and it is personally run by the owners, the Ronchetti family, who has been taking care of the guests for more than one century. 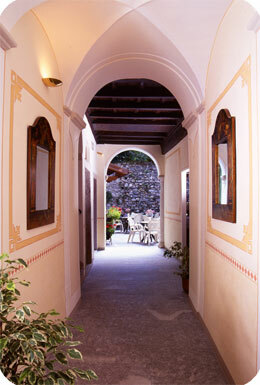 The incredible attention to detail makes the hotel "Contrada dei Monti" a true gem. In this unique place a peaceful magic is created through the local style architecture: exposed wooden beams, traditional wrought ironwork and closing fixtures, as well as furniture and paintings. Every floor is defined by its dominating colour starting from the warm tones of yellow and red and finishing with the more soothing green. The renovation of the building has been directed by the owners, who paid attention to every detail. It is the particular care and focus on the details that makes this hotel a true gem. Breakfast is the good starting point of planning the day: sipping a warm beverage, tasting a freshly baked croissant meanwhile gathering information chatting with the staff and other guest brings a variety of choices and options to explore locally . The intimate and familiar atmopshere enable guests to relax and enjoy the rich buffet. During the summer breakfast is also served outdoor in the charming garden. To have a nice break during the day to read a good book or to have a pre-dinner drink or simply for a very quiet after dinner time... Precious moments to spend alone or in good company in such a relaxing and warming special corner. e l'araldica insegna ti svetta di fronte. premesse palesi e preludio di momenti felici. a vegliare il tuo sonno c'é un raggio di luna. con ai piedi le ali e gli occhi intrisi di nostalgia. For details visit the page "LOCATION"